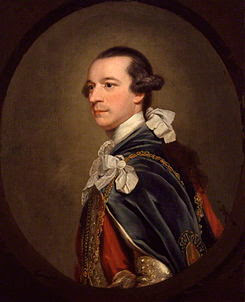 Known to my dear old Mother Gilflurt as Charlie, Rockingham served two terms as Whig Prime Minister of Great Britain between 1765-1766 and again in 1782. Noted for his support of the colonists in America, Charlie was the leader of the Rockingham Whigs faction and a force to be reckoned with in the House of Commons. A particular favourite of King George II, Charlie eventually fell from favour after he and the King disagreed on a fair few policies but this did little harm to his political career and three years later, he became Prime Minister. His first term was a short one due to Cabinet infighting and though he returned to high office in 1782, a fatal bout of influenza ended his parliamentary career for good.